How can I have a Facebook box slide up at the end of the content? List25 uses custom code for that. May be we will add a tutorial about it in the future. Meanwhile, did you check OptinMonster‘s slide in optin? It is a lot easier. I am using a insert post ad plugin on my blog, its working fine except the position of the ad which is left. How can I move it to center? I use this code and it works well on my blog. Now i want to add more 1 extra ads code to display after another paragraph. 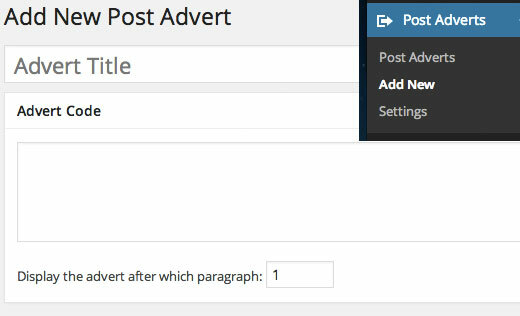 The plugin method is great and I’ve added a couple of ads; one appears after 3rd paragraph and the other appears at the end of the content. This is exactly what I’m looking for since editing the code is always a pain for me every time my site’s theme gets updated. I know I should be using a child theme, but that’s just a lot of mess — your method is much cleaner and less headache. Thanks. Hey , I also Implemented this code and it worked well ! Now i want to add code to show add at the end of the content ? How Would I Change this php code to show add at the end ? Is there a way to set which ads will show for various post categories? For instance, I might show a different CTA for a technology post than I would for finance post. I want to add ads in the side of post content please help me for this. Not happy now. Added the code and now my site is broken. What have I done wrong. I cant even load my site anymore? I added the code to the bottom line as is explained in here. then removed the “ads code goes here” and replaced with my adsense code. But now my site wont even load. HELP please. The site specific plugin method you provided is working like a charm for me. Thanks! Is there any way to trigger the site specific plugin only if a blog post has a minimum number of paragraphs? For example- I want the ad to appear only if the blog post is at least 10 paragraphs long. Is there any way to add that criteria to the site specific code you provided? The ad should appear only if the minimum para criteria has been satisfied. Not working at all.. I help try all the steps but it doesn’t work. Any help.!! My functions.php file is full of stuff. Where exactly do I paste the code? Thank you! At the end of the file. If you have a ?> tag at the end, then paste the code before it. so I decided to logout my dashboard, i tried to login back by going to my w-admin page, these are errors showed up on blank screen. I’m just not able to login, could you help please? Please see our guide on what to do when you are locked out of WordPress admin area. Remove the code from the functions file. Thanks for the plugin. However, when I deselect the posts and pages options in the settings section it will not save that setting. Either posts or pages or both have to be checked for the settings to be saved. Plugin works fine but how can i center the div class? Cool! Thanks for the great tip. I manage to add my banner in every page and post. where $ad_code2 is the second adsense code, it shows nothing? Don’t return the content before you have added both ads. I implemented a loop add the code in for each adverts before returning the content. In my example I am actually storing my adverts in a database then based on the targeting criteria I return an object with all the adverts for the specific ad unit placement. It them loops and add each advert. I have used various different classes in my plugin, so you will need to change the function name to suit yours. You are great! thanks for second ads filter. but some posts have not enough paragraph count. It does not have the total count of paragraphs. I want to add to the end of the post in the second filter. How do I do it? sorry for my english thanks! I’m afraid the code isn’t working anymore.. any tips? Does it need to be under Single.PHP for some themes maybe? Thank you for this code. Wow, it did exactly what I needed. Hi I just downloaded the plugin and it is exactly what I needed. However I have a question which I hope you can answer. I have a lot of articles where my ads don’t apply to. Is there a way to just add the ad when I need it? I know you have the option to include o or exclude from the current and future posts but what about the old posts? Do I have to do this manually? Hey , will the code method conflict with the auto social media post? Hello! I am looking to add a custom Pin It button after every first image in my posts. It seems like this method might work. How do I have it show up after the first image, not the first tag? Thanks! wow! I loveth this. Thanks for the brainwave. But can I install the plugin to add ads, and at the same time I used the code method as well? Yes you can do that but why? Keep in mind that your site safety is comprimitted by using plugins for every little thing you want. This code works and there is no need for extra plugin. Can you please support for floating left or right ads in single post? Plus one. Great plugin. The ability to right align and wrap content around next paragraph (float: right?) would be great. I fiddled around with WP custom css for #boxmap but could not get it right. Any tips. How can i make the ads align to the center of the post. You can do either style the div element or add Your Ad code here tag to align the ads in center of the post. You have to remove the <?php tag and paste the rest of the code in functions.php file. How would this function work if you wanted to add two ads. Say one after the 2nd paragraph and then another one after the 4th paragraph? Please I’m new to blogging and ads, not to talk of the codes. I want to know if its possible to to add the AdSense code in posts using a smartphone. Hi, wanted to know that why do you have above the fold ad on your site? Please elaborate, as I read it’s bad for seo? We do not have any ads above the fold. We have a banner which expands and shows links to different sections of our website. We also don’t think that above the fold ads are bad for SEO unless they are disruptive. Particularly on mobile devices, ads placed just before the content make it difficult for users to tap on links.